Ancient gods in modern times. Before Therese and Thanatos can come to terms with the uncertain future of their unborn twins, Poseidon is attacked and both his wife and trident are stolen. In this final installment of The Gatekeeper's Saga, Therese is forced to deliver her babies in the midst of an all-out war with enemies more powerful than the Olympians. This novel was much more action packed than its predecessors. Battles are waged, entire ways of life are defended, yet Pohler tactfully avoids the violence in this tale. I found myself caught up in the plight of the characters, trying to help them along, and keep them on the winning side, even when it seemed impossible. Pohler also kept me on my toes, guessing and racing forward to see what happens next. More than once I found myself exclaiming, I soooo did not see this coming. At the same time, Pohler stays true to the Greek myths while making them all her own. She also adds an extra emotional component to this tale. The emotional traumas of the past come forward and the healing begins. I appreciate how Pohler depicts this as an honest and ongoing effort. It makes this novel real & human yet sublimely god(dess) driven. Although no new characters are introduced in this novel, the personalities of the characters continue to evolve based on their current circumstances. Even the oldest immortals adapt to their current circumstances. The contrast between the mortal and immortal personalities was both comical and enlightening. Pohler highlights not only the godly viewpoint, but also the disparity that Therese had to cross. The similarities between the two groups also become much more apparent in this instalment. Their hopes and fears collide into a single world. As a whole, this story was informative, enlightening, and a pleasure to read. I laughed, I cried, I enjoyed. It’s a story that parents and teens alike will love. 5.0 out of 5 starsBEST MYTHOLOGY SERIES! As The Gatekeeper's Saga comes to a close, I find myself with mixed emotions. Yes, I was super excited to read The Gatekeeper's Promise because it seemed like forever before it was out, and yet, I'm so sad that it's over! This series is my favorite mythology series EVER! In The Gatekeeper's Secret, we were left with the fact that Therese and Than were pregnant and having twins, as well as with the uncertain future of having them. When The Gatekeeper's Promise starts, it's action packed from the get go. As Therese and Than try to come to grips with the twins future, the battle begins, and with Gods and Goddess' going to war, the unexpected becomes the expected, and yet, still shocking! I love how Eva didn't add any new characters but had the characters throughout the series grow and evolve instead. They become more mature as time goes on. Eva had the personalities of the mortal and immortal world collide and finally get along. There were so many times when I would say out loud, I DID NOT see that coming! I laughed, cried, yelled, cheered, and just generally went on a crazy emotional roller coaster ride. This series was GREAT from start to end and hopefully we will hear a reunion in the making at some point (hint hint)! I recommend this book to parents and kids alike as both will enjoy A LOT! Eva has done a wonderful job with the ending of the Gatekeeper's Saga. As always, there is adventure, romance and of course, greek gods. Therese and Than are patiently or impatiently awaiting the birth of their twins. And are faced with a dilemma of having two mortal children from two immortal parents. Hip, Than's brother is trying to find away to be with his mortal love, Jen. In comes all the Greek Gods and trouble is brewing once again. Its a power struggle at its finest. Can the Gods keep it together long enough for the twins to be born or will everything fall to pieces? The Gatekeeper's Saga is great and should be read not only by Teens but anyone else looking for a clean romantic story. I can't believe this is the end to the Gatekeeper's Saga. I have fallen in love with Than and Therese over the series. The supporting cast of characters are phenomenal. Each book in the series has kept me up and craving more. This one is packed with far more action than the rest, with gods battling, kidnapping, deception, stolen powers, and more. With all of the plot twists, you will be on the edge of your seat the whole time! If you like a happily ever after to a series, you will be quite pleased with this one. 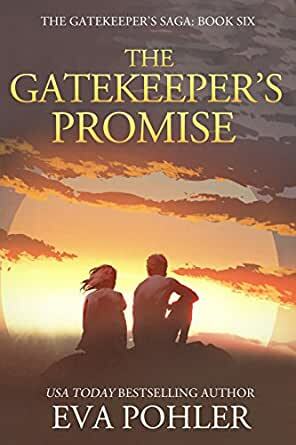 I love all of Eva Pohler's work and The Gatekeeper's Promise doesn't let you down! From the first page until the end, I was thinking the story would go one way and she tricked me and it was even better than I thought! The interweaving of the mortal and immortal desires are always well written. I want to come and live with them, and be like them! The action of the story is fast paced and written in a way that any teen or above can and should read it! This is a series that parents can share with their children and allow them to not only learn about the fiction side, but not worry they are filling their heads with junk! While I am sad to see the series end, I am hopeful that there will be a spinoff! !